The Armature is the first City-led “green street” pilot project and the heart of The Quarters Downtown. This pedestrian-oriented corridor runs along 96 Street from Jasper Avenue to 103 A Avenue, connecting the four unique districts that make up The Quarters Downtown. Upon full build-out, it will contain all-season parks, urban plazas, shopping, eating, and entertainment areas, and will serve as a hub for all commercial and social activities in the area. The first priority of the Armature is to accommodate pedestrians and then the cyclists. Custom furniture, bike racks and lamp posts along the street have been created specifically for the Armature to create an inviting atmosphere where people can linger and enjoy the nearby amenities. In addition to custom furniture, all curbs along the street are rolled and easily mountable. Cyclists can travel the entire length of the Armature in both directions, connecting to the City’s larger bike network. This was the first city-led “green street", meaning it was not a typical street resurfacing project. Construction of the Armature began in 2013 with a separation of the sanitary and stormwater infrastructure and upgraded infrastructure capacity. 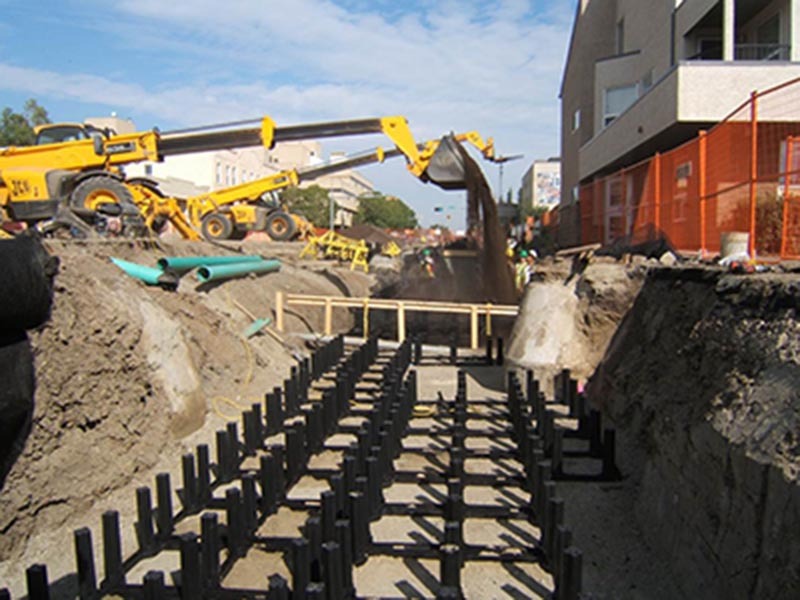 Silva cells were installed on both sides of the roadway, providing a greater volume of soil and more room for street tree roots to expand and grow, ultimately helping to sustain healthier vegetation. The system on the east side of the roadway has been designed to collect and channel water from the roadway into the soil system, reducing the runoff that goes into the storm system. There are several public art installations along the Armature. These pieces have been curated by the Edmonton Arts Council. The two bronze sculptures situated along the Armature were designed by Brandon Vickerd of Hamilton, Ontario. The statues appear to be regular citizens posed in a casual manner, but are actually an assortment of squirrels, racoons, and other animals working together to appear human. The sculptures are meant to humorously reference the cartoon cliché of animals emulating humans, and they invite reflection of human relationship to nature. Wild Rose was designed by Rebecca Belmore and Osvaldo Yero of Winnipeg, MB. The stainless steel sculpture is based on the provincial flower and the provincial tree - the wild rose and the lodgepole pine. When viewed from a distance, the 18 foot sculpture looks like and oversized flower. However, up close, the contemporary sculpture reveals itself as a large piece of cloth that has been caught on a lodgepole pine, fluttering in the wind. 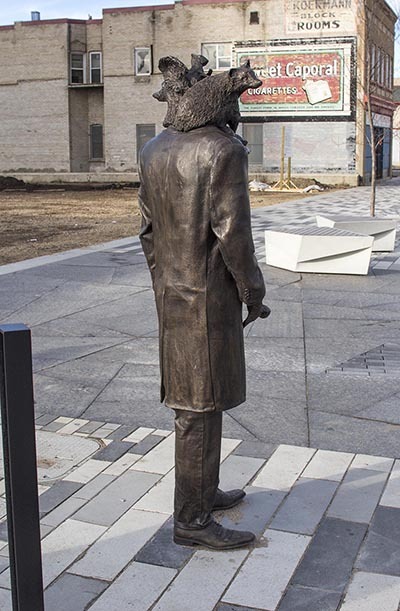 Beginning at Jasper Avenue and heading north to 103 A Avenue, visitors to 96 Street can enjoy poetry by Derek Besant. The poetry was sandblasted into the granite mid-block crossings all along 96 Street.